The Visual Science Lab / Kirk Tuck: On an exciting adventure with Super Assistant, Amy S. Tales of Nikons and flashes and electricity. On an exciting adventure with Super Assistant, Amy S. Tales of Nikons and flashes and electricity. It was still dark when Amy pulled up in front of my house, grabbed her grip gear and headed over to the studio car. She had a look in her eye that said, clearly, "You want me up at this ungodly hour you damn sure better be stopping by Starbucks!" I had loaded the car up with all the things I thought I would need last night and just had to put the case of cameras and lenses in (we don't leave cameras in the car overnight...). After swinging by the coffee shop we headed up Mopac Expressway and on to our destination in a small town on the other side of Lake Travis. We were off to shoot day two of an annual report project for a utility client. 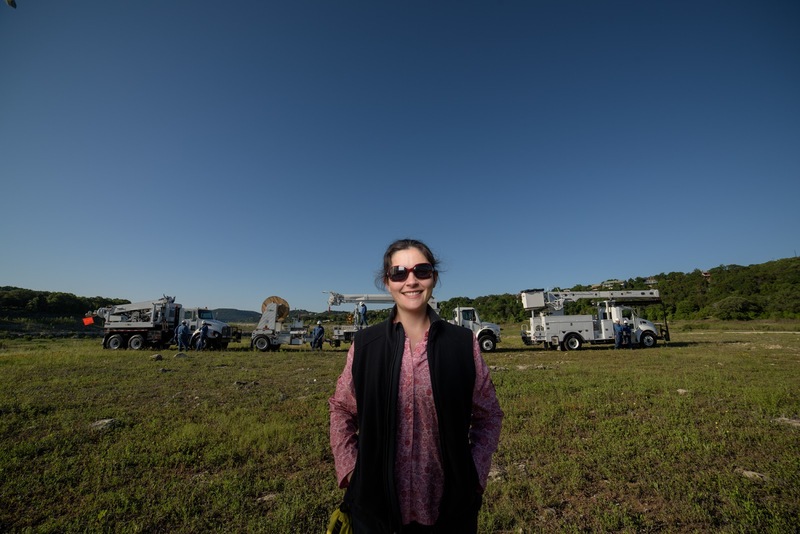 Our first shot was the CEO standing in a field in front of a row of several of the company's trucks. We positioned the trucks in the early dawn using a compass to make sure we'd get light on the sides of the trucks in the time window in which we were shooting. We started ultra wide, using a Rokinon 14mm f3.2 Cine lens on a D810. Amy put up a two stop diffusion scrim to the right of where we would be our main subject, the CEO, to block direct, angled sunlight from hitting him and then we lit a sweet spot of our exec to stand in with a large softbox (30 x 40 inches) from the right side of the camera. The box light was powered with an Elinchrom flash head and an Elinchrom Ranger RX AS system (1100 watt seconds at full, we used it at 3/4th power). All through this shoot we had the new Marshall Electronics monitor plugged in to the camera; not so much for my use because I had the monitor on the back of the camera to reference, but so the art director, the marketing director and the CEO could look at the images and buy into the project as we were producing it. I was taking advantage of some of the D810's special features to make the shots I wanted. The first cool thing was to use the ISO 64 option. ISO 64 is not some pushed or pulled "extra" setting on the ISO dial, rather it's the native ISO for the camera. It's at this setting that the dynamic range is widest and the light transfer is at its highest efficiency. It also allowed me to use a shutter speed of 1/250th of a second with f8.0 so I could sync flash and control the ambient light in the background in an optimum manner. The second two features would of course be the wide dynamic range of the camera and its high resolution and sharpness. I had the monitor attached to one leg of the tripod via a Manfrotto Magic Arm. In this way I could angle the monitor away from the sun and over to the side away from the camera so I could continue working while the clients reviewed the images on the monitor and we wouldn't step on each other in the process. I had forgotten how wonderful it can be to work with a diligent, professional and highly trained assistant. Amy was totally focused on making the shoot work smoothly for me (first) and then the client. Light stands got sandbagged as a matter of course, apple boxes magically appeared when I was ready for a higher elevation on the tripod. Bottled water appeared in my hands at just the right moment and disappeared when I was ready to re-embrace the camera. One thing I particularly loved was having Amy provide a "courtesy" flag for me when I was working in direct sun. We'd set up the camera and if I was standing in full sun Amy would appear with a black flag and hold it over me to minimize reflections on the camera screen and to keep me from getting sunburnt. When I stopped to talk with the client Amy would immediately head to the equipment cases to bring order to gear chaos, to wrap cables, find errant lens caps and stuff soft boxes, hastily tossed to one side, back into their correct cases. Another advantage of a good assistant is their patience in "standing in" for the final subject so the photographer can make sure the diffusion scrim will cover the subject with good shade and to make sure the composition really works once other humans are inserted. I worked with an interesting assortment of lenses today. We started and ended with the 14mm Rokinon Cine lens and I will readily admit it's getting a lot more use since I uploaded a custom lens profile for it into Lightroom CC. I shot raw all day long and I immediately selected the profile when I got back into the studio and batched it to all the 14mm shots in the folder. It was fun to watch the previews pop into corrected-ness as the program churned through the giant files. The lens that ended up in second place (as far as number of frames goes) was the older Nikon 25-50mm f4.0 ais Nikon lens. It requires a bit more contrast and bit of a sharpness boost in post production compared to some of the other lenses but once treated correctly it blossoms and is beautiful and highly detailed, but in a nice, calm way. I used it for abstract/technical shots in an electrical substation and I also used the longer end for some environmental portraits; both inside a substation control center and out in the field. I used the Sigma 50mm f1.4 Art lens for one series of the CEO standing with a series of transformers behind him. It's my first encounter with this lens and I was duly impressed with the high resolution and drawing of that lens. I need to experiment more with it but it's a very fine optic, especially used the way we did, at f5.6 and focused manually to about 10 feet. I got good use out of the old 80-200mm lens when we we're photographing electricians working in bucket trucks and being lifted up into the nose bleed heights and also for tight headshots of the CEO and other key employees. A nod also to the 24-85mm Nikon G lens for helping me get a bunch of quick moving, hand held images of truck crews. Once we switched locations and concentrated on getting a good selection of environmental portraits of the CEO we also switched from using the heavy and powerful Elinchrom Ranger flash system to using a low cost, low weight combination of two Yongnuo electronic flashes triggered by Cactus V6 transceivers and ultimately triggered by a Cactus flash with built-in transceiver in the hot shoe of the camera. The flashes were firing into a 48 inch Softlighter umbrella that was postponed about six feet from out subject. With both flashes set to half power and a double net cutting sunlight on the CEO the lighting output was just right and the recycle time was good. Interesting tip: We usually use a light, silk diffusion cloth on a Chimera ENG panel to block sunlight from hitting our exterior portrait subjects directly but we had a consistent wind today that threatened to either flip the panels around in their clamps or act as sails and knock the stands down altogether. In situations like this you can use black "double nets" to knock down the effect of sunlight coming from one side or above. The net allows air through the mesh and so is less prone to becoming sail-like and creating mischief. The net, when compared to the silk, also gives you a different and more intriguing look in portraits. A certain harder quality to the skin tones that can work well. The flash and camera batteries worked all day long without slowing down but when we hit frame 700 at about 3 pm the batteries in the field monitor finally gave it up. I was about to have Amy replace them. We had plenty of spares as it uses the same batteries as the big Nikons. But I held off because I could tell that the darkening and surrender of the monitor gave the client the suggestion that we'd done what we'd set out to for the day. All the batteries are back on the chargers. I've downloaded and color corrected today's files in groups. I am currently in the process of uploading them into a private gallery on the service I've used for online proofing since 2005. It's Smugmug.com and so far it's rare for them to ever miss a beat. I have over 150,000 files uploaded into the site for my clients and even folks who worked with us ten years ago can go back and reference their galleries at any time. I am halfway through the uploading of photographs to my online gallery and thinking about the rest of the project. We have two or three more days of shooting and I need to supervise a drone shoot before all is said and done. I am happy to say that we're providing the client with a fast moving team, quick and effective lighting designs and good, general problem solving and we're collaborating on the look and feel of the images for the annual report. In the end my goal is to work hard at making all of this easy. I want the client to end up with a cohesive selection of images. I want their biggest problem to be that they are unable to choose because they have so many good options. I've been working since 6 am and it's now almost 9:45pm. When the last of the files is uploaded I'll take my sore, tired body and crawl into the house, grab some water, brush my teeth and get ready to do it all over again tomorrow. After tomorrow we take a break. Utility companies don't push their employees ( or suppliers) to work all weekend. We'll take up again on Monday. But that doesn't mean that freelance photographers can kick back and just enjoy the weekend. We have a shoot for Zach Theatre on Saturday; we're making new images for their season brochure. And as you probably know I always think working with actors and their creative teams is fun. On Sunday I'm spending the day shooting advertising images for the Bob Bullock Texas State History Museum. Also a fun client and this year their newly redesigned website took gold at the annual convention of museums in the U.S. I was thrilled that my photography was so well represented. The countdown is one week and a day until the boy is back in Austin and Studio Dog is once again euphoric. Hope you are also having a fun and productive week!